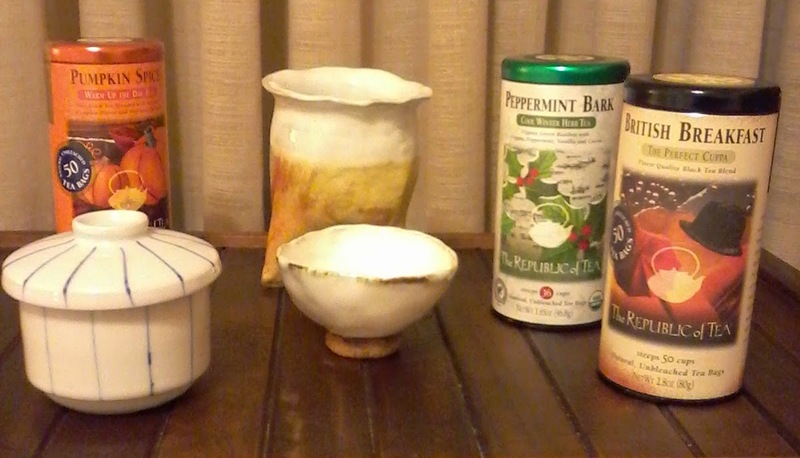 In the next three posts we will be reviewing teas from The Republic of Tea. The following teas were sent by and courtesy of The Republic of Tea Team. 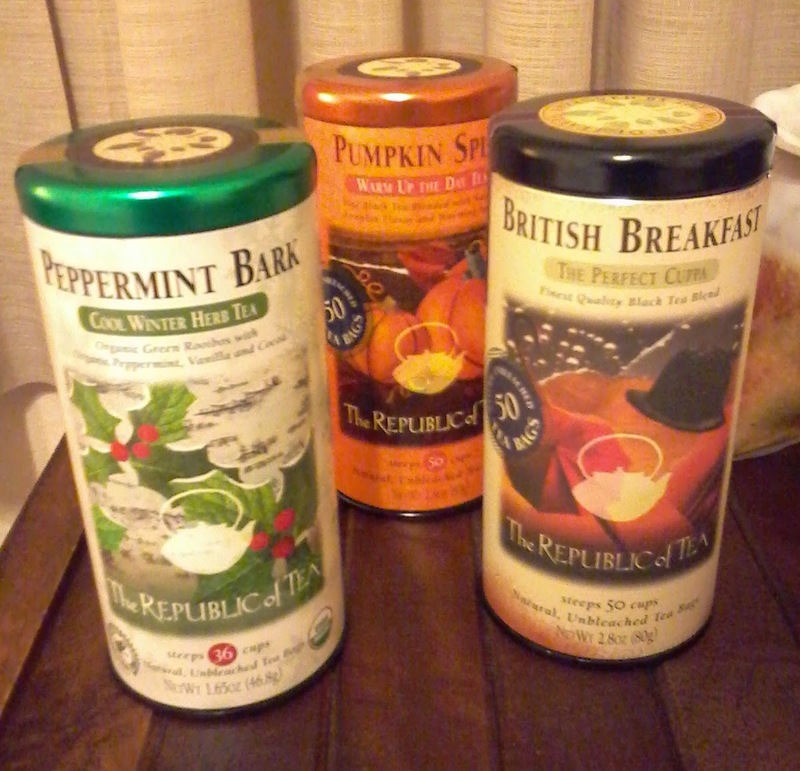 The tea are of Pumpkin Spice, British Breakfast and Peppermint Bark. 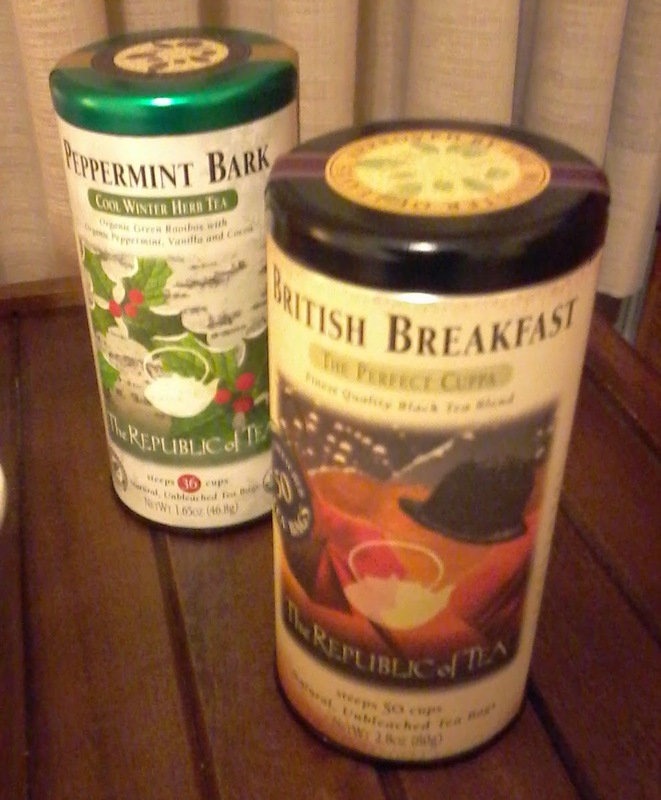 The Pumpkin Spice and Peppermint Bark are scented teas, while the British Breakfast is a blend of black teas. These are teabags that are packed in brightly labeled and airtight tin cans. Each can comes with suggestions for brewing with regards to time and temperature and the leeway of personal preferences. According to the label only sustainable derived ingredients are utilized. There is also a Caffeine Content indicator on the label. Peppermint Bark comes in 1.65 oz can that contain 36 teabags. This is a blend of organic ingredients - green Rooibos, Peppermint, Cocoa extract, Stevia leaf, vanilla flavors and natural flavor. This is a Kosher certified tea, with the USDA Organic and Certified Organic Quality Assurance International stamp of approval. It also carries the stamp of approvals for Gluten Free, Rainforest Alliance Certified for Rooibos and NON GMO Project verification. Pumpkin Spice is a blend of black tea, ginger, cinnamon, ginger, nutmeg, cloves, allspice, Sweet Blackberry leaves and Pumpkin flavors. The can contains 50 teabags with a total weight of 2.8 oz. This is a Gluten Free certified tea blend. British Breakfast blends black teas from Assam, Ceylon, Darjeeling and Africa. Contains 50 teabags in a can of 2.8oz. Kosher Certified, Gluten Free and NON GMO Project verified. We will be doing a taste tests for each of these teas.